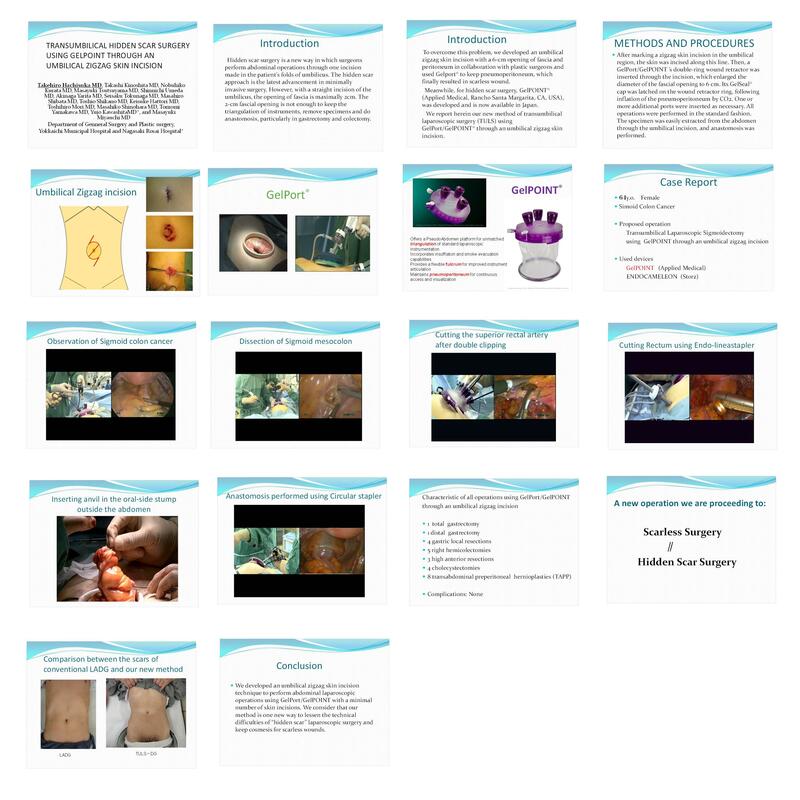 INTRODUCTION) Hidden scar surgery is a new way in which surgeons perform abdominal operations through one incision made in the patient’s folds of umbilicus. The hidden scar approach is the latest advancement in minimally invasive surgery. However, with a straight incision of the umbilicus, the opening of fascia is maximally 2cm. The 2-cm fascial opening is not enough to keep the triangulation of instruments, remove specimens and do anastomosis, particularly in gastrectomy and colectomy. To overcome this problem, we developed an umbilical zigzag skin incision with a 6-cm opening of fascia and peritoneum in collaboration with plastic surgeons and used Gelport® to keep pneumoperitoneum, which finally resulted in scarless wound1) This technique is a modification of umbilicoplasties for umbilical deformities by plastic surgeons2,3). We have already experienced 24 abdominal operations including 1 total gastrectomy, 1 distal gastrectomy, 3 gastric local resections, 5 right hemicolectomies, 3 high anterior resections, 4 cholecystectomies, and 7 transabdominal preperitoneal hernioplasties (TAPP) . Meanwhile, for hidden scar surgery, GelPOINT® (Applied Medical, Rancho Santa Margarita, CA, USA), was developed to maintain triangulation, fulcrum and pneumoperitoneum during the laparoscopic procedure. The product was available in Japan this year and used to many procedures through our umbilical zigzag incision in our institution. We report herein our new method of transumbilical laparoscopic surgery (TULS) using GelPOINT® through an umbilical zigzag skin incision. METHODS AND PROCEDURES) After marking a zigzag skin incision in the umbilical region, the skin was incised along this line. Then, a GelPOINT® ’s double-ring wound retractor was inserted through the incision, which enlarged the diameter of the fascial opening to 6 cm. Its GelSeal® cap was latched on the wound retractor ring, following inflation of the pneumoperitoneum by CO2. One or more additional ports were inserted as necessary. All operations were performed in the standard fashion. The specimen was easily extracted from the abdomen through the umbilical incision, and anastomosis was performed. RESULTS) Using the above method, we performed the following:1 right hemicolectomy, 1 high anterior resection, 2 cholecystectomies, and 2 transabdominal preperitoneal hernioplasties (TAPP). All cases were accomplished by this method without any complications. The wounds of the umbilical region were almost “scarless” in all cases. DISCUSSION) We developed an umbilical zigzag skin incision technique to perform abdominal laparoscopic operations using GelPOINT® with a minimal number of skin incisions. We consider that our method is one new way to lessen the technical difficulties of “hidden scar” laparoscopic surgery and keep cosmesis for scarless wounds.